Veteran Alan Kinnear would like to thank everyone who has donated used football boots to him over the past year. 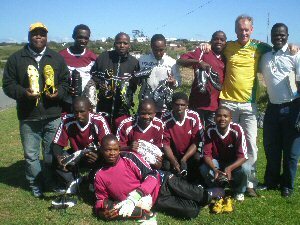 Alan distributes the boots to youth teams in South Africa, where the £30 required for a new pair is equivalent to a weekly wage. Alan is pictured here with the Ekulpumajani Teenagers, whose kit is run on a collective basis - if you are picked you get a choice of boots for the match. You never know, your old boots may be worn by a future star from the African continent! Thanks once again for your old kit.